Management of iConverter chassis and modules is achieved by adding an iConverter Network Management Module (NMM2) or a Network Interface Device (NID) with built-in management to the chassis. An iConverter NID can manage an iConverter chassis of modules, or manage itself as a standalone unit. NetOutlook Standard Edition provides configuration, monitoring and reporting for all iConverter modules and chassis. The Standard Edition supports IEEE 802.3ah and IP-less management when used with iConverter NIDs. NetOutlook Carrier Ethernet Edition supports all the functionality of the Standard Edition, and adds advanced Service Management functionality for the iConverter GM3, GM4 and XM5 NIDs. NetOutlook is a powerful Graphical User Interface (GUI) that serves as a single integrated point of access to the entire suite of iConverter products. Chassis and module functionality is accessible through NetOutlook including configuration, troubleshooting, maintenance and performance monitoring. Omnitron’s secure IP-Less remote management channel allows management of a large number of modules and chassis through one IP address. It also provides an added level of security for the management channel that is not affected by end-user actions or traffic on the system. The IP address is isolated to a physically secure management station at the network core, and does not exist on the fibre link or on the Network Interface Device at the network edge. NetOutlook allows remote configuration of all product functionality: VLAN membership assignments Quality of Service (QoS) prioritization, Port Access Control, Bandwidth Control Auto-Negotiation and Duplex Modes Link Fault Detection Modes DWDM Wavelength Tuning NetOutlook allows network parameters to be remotely configured from a single location, providing a convenient and time-saving solution for large-scale deployments. NetOutlook Carrier Ethernet Edition adds the ability to manage, provision and monitor Carrier Ethernet mobile backhaul and business services. NetOutlook Carrier Ethernet Edition supports all features in the Standard Edition. The NetOutlook Carrier Ethernet Edition supports remote provisioning of Ethernet Virtual Connections (EVCs), including 802.1ad Provider Bridge VLAN stacking (Q-in-Q) for service multiplexing, Class of Service (CoS), granular rate-limiting, per-flow service mapping and traffic policing and shaping with Hierarchical Rate Limiting. When used with the GM4 NID, the Carrier Ethernet Edition provisions ITU-T Y.1564 and RFC 2544 service testing to rapidly verify the configuration and performance of Ethernet services prior to customer hand off. 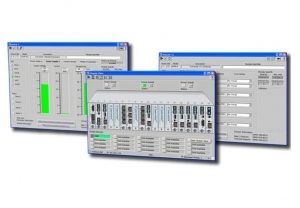 The Carrier Ethernet Edition can be used to monitor and generate reports for key SLA parameters, including Frame Delay, Frame Delay Variation, Frame Loss and Availability. IEEE 802.1ag Connectivity Fault Management (CFM) proactively monitors service availability and provides tools for rapid fault isolation. The Carrier Ethernet Edition can be used to configure several protection switching protocols.